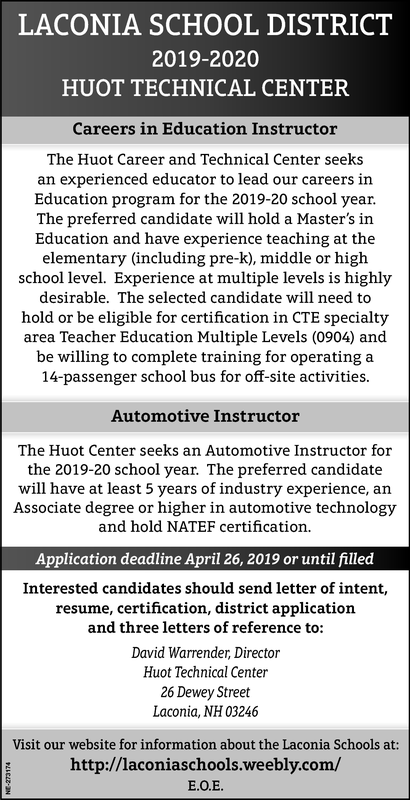 The Huot Career and Technical Center seeks an experienced educator to lead our careers in Education program for the 2019-20 school year. The preferred candidate will hold a Master s in Education and have experience teaching at the elementary (including pre-k), middle or high school level. Experience at multiple levels is highly desirable. The selected candidate will need to hold or be eligible for certification in CTE specialty area Teacher Education Multiple Levels (0904) and be willing to complete training for operating a 14-passenger school bus for off-site activities. The Huot Center seeks an Automotive Instructor for the 2019-20 school year. The preferred candidate will have at least 5 years of industry experience, an Associate degree or higher in automotive technology and hold NATEF certification.